The year- round makeup of road users here is older than anywhere else in the USA. They attract their peers to visit them and the area’s amenities. 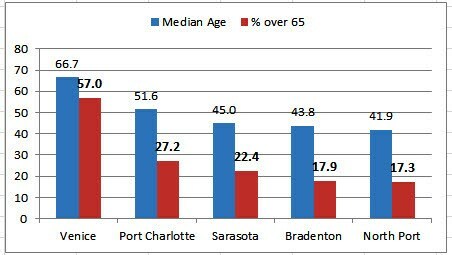 The Sarasota and Manatee Counties contain some of the USA’s largest concentrations of seniors, who are living longer and driving longer. 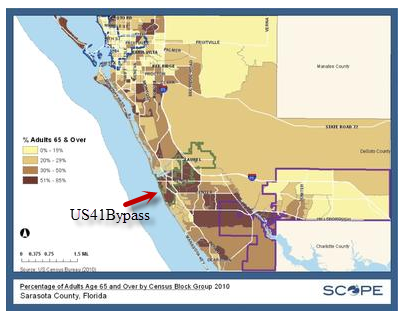 A third of permanent residents in Sarasota County today are older than age 65, the same percentage the nation is projected to have in 2050 (Sarasota Institute for the Ages). Older road users’ safer mobility is stressed by the Federal Highway Administration, the Institute of Traffic Engineers, Insurance Institute of the Highway Safety, Transportation Research Bureau, the AARP, and others (below). The US41Multimodal Emphasis Corridor is the adopted#2 Major Project Funding Priority. Of the Sarasota Manatee Metropolitan Planning Organization (MPO)http://www.mympo.org/us41-multi-modal-emphasis-corridor. Markings “With many seniors driving on our roads, doesn’t it make sense that more frequently replacing traffic lines would be a good safety investment?” Letter to the editor. Sarasota Herald Tribune, Wednesday, January 22, 2014. If involved in a crash, older drivers and older passengers are more likely to be killed than younger passengers because of their increased fragility. Crashes cost the United States more than $230 billion annually in productivity losses, property damage, medical costs, legal costs, emergency services, insurance costs and cost to employers. Drivers 85 years of age and older are 10 times more likely as drivers in the 40-49 age group to have multi-vehicle intersection crashes. Older drivers do not cope as well as younger ones with complex traffic situations, and multiple-vehicle crashes at intersections increase markedly with age. Older people are more susceptible than younger ones to medical complications following motor vehicle crash injuries. This means they are more likely to die from their injuries. Crashes are often caused by speeds that are too high to allow drivers time to judge other cars’ speeds, their distance, and whether there is enough of a gap to make a turn (doesn’t just affect older drivers)… arterials, collectors, and distributors need different solutions …. left turns are of special concern to elderly drivers as speed, distance, and gap judgments are more difficult. Bodies become more fragile and susceptible to injury as we age; therefore, fatal traffic crashes per mile driven become more frequent as age increases. AARP – National Household Travel Survey data series. One type of travel that has seen astonishing growth and can be expected to continue to grow is travel to access medical services. While the distance traveled for the average trip to access medical services has remained about the same for the past three decades, the number of medical trips has skyrocketed. AASHTO American Association of State Highway and Transportation Officials. Although relatively few deaths of older (over 55) drivers involve motor vehicles, they have higher rates of fatal crashes than all but the youngest drivers. Safe Driving for Older Adults Helpful tips about coping with these changes are also provided so that you can remain a safe driver for as long as possible. Older drivers are keeping their licenses longer and driving more miles than in the past. Per mile traveled, fatal crash rates increase noticeably starting at age 70-74 and are highest among drivers 85 and older. The increased fatal crash risk among older drivers is largely due to their increased susceptibility to injury, particularly chest injuries, and medical complications, rather than an increased tendency to get into crashes. FDOT – Florida Department of Transportation. 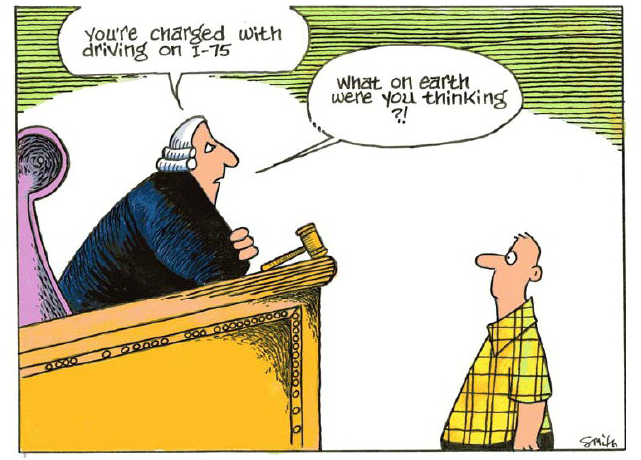 Aging Roadway Users. An increasing number of adults age 65 and older travel Florida’s roads and highways as drivers, passengers, motorcyclists, bicyclists and pedestrians. From 2007 to 2009, adults age 65 and older made up an increasing percentage of all fatalities from crashes over the three years – 18.3 percent, 18.7 percent and 20.6 percent, respectively. Bridge the gap between driving retirement and mobility independence (i.e., alternative transportation mobility options, public transportation, and dementia-friendly transportation).